You've got questions. We've got answers. If you don't see your question answered here, just drop us a note and we'll get back to you as fast as The Beast allows. And just for good measure, we'll add your question along with our answer here as well. Beast Crawl is a free, annual, local festival that showcases the literary diversity and talent of performers with deep roots in the East Bay. I'd like to volunteer! How do I do that? Contact us and we'll get back to you soon and let you know how you can help. Thanks! I'm reading at Beast Crawl. How do I submit my bio information? Contact and make arrangements with the curator for your reading. Beast Crawl curators control all event details to be shared with Beast Crawl organizers and this website. If you would like a photo displayed with your bio, be sure to send it to your curator so they can pass it along to us. How much does Beast Crawl cost? The Beast is an entirely free event, though we do encourage you to spend your hard earned cash at the venues that graciously host the readings. We believe in supporting local business and your patronage helps make that happen, along with contributing to their willingness to host us again next year! On the night of the crawl, where can I go to find information? Well, besides using your smartphone to access this mobile-friendly website, you can also stop by our information table setup with maps, event guides, and helpful folks that can point you in the right direction. What are these numbers next to the venues everywhere on the website? Each year, we create a map that you can use to find your way around during the night of the crawl. Each venue can be located on the map by referencing its number. Is there any way to attend all of the readings? Sadly, with over 30 separate reading events, until scientists figure out cloning, time travel, or alternate reality spanning, you can only attend one reading event per leg. But hey, three readings in total ain't bad... that's at least twice as many as you'd normally find on any one night! 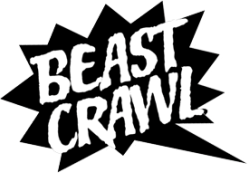 I'd like to attend Beast Crawl with my family / children / young adults / students under the legal drinking age. Are the readings open to all ages? Unfortunately this is determined by the location of each reading. Certain venues such as bars that only serve alcohol are Over 21 only. Other venues may not be legally inaccessible but still might not be appropriate for all ages (though this is true for many of the readings as well). On the Venues subpages, we have created a list of venues that are safely All Ages. Use this information and your best judgement of the reading descriptions to determine which readings you are comfortable attending. I'm excited about Beast Crawl. Where can I talk to others and share thoughts on this event? We're excited that you're excited. We try to make it easy for everyone to participate somehow in the event. If you'd like to converse with other people interested in The Beast, please like our Facebook page. Then you can see who else is interested and join in the conversation. You can also follow us on Twitter and Tumblr. And if you'd like, please add #beastcrawl to any related tweets or photos you upload to Flickr. Both might be automatically included here on this site for everyone to see (so please be nice). I'd like to read at Beast Crawl. How do I submit my work for consideration? Thank you for your interest. We work on a model of empowerment for our curators. They control their respective reading lineup and decide who can read for their event. So your best bet is to get involved! Take a look at our Curators page and check out their ongoing events that happen outside of Beast Crawl. Attend their readings, and submit to them directly. If you don't get chosen, please don't give up. There's always next year. The more you participate in the thriving East Bay literary scene, the more opportunities you will have to read at The Beast. Also, we're always looking for more volunteers and that's a great way to meet curators and determine which reading would be the best fit for your work. So let us know if you're interested in helping out.